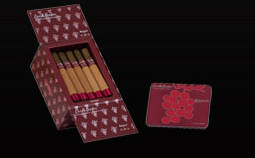 The CAO Earth Nectar cigars pay homage to Mother Earth and the rich soil of Italy’s cherished Tuscany. An all natural blend of toasted almonds, cocoa, honey and raisins combine with an infusion of the finest chianti to embellish a fine blend of Cuban-seed Dominican tobaccos and finished with a grade-one Cameroon wrapper. The thickest cigar in the Earth Nectar flavor. Not overly sweet but loaded with fine wine and hits of cocoa. The 2nd thickest cigar in the Earth Nectar flavor. Not overly sweet but loaded with fine wine and hits of cocoa. Perfectly sized for 30-40 minutes of smoking pleasure. Not overly sweet but loaded with fine wine and hits of cocoa. Perfectly sized for 20-30 minutes of smoking pleasure. Not too long, not too fat! A favorite among the lady smokers. Nice sweet tropical flavors, hints of coconut and vanilla. Perfectly sized for 10-20 minutes of smoking pleasure. Each tin contains 10 cigars. Not overly sweet but loaded with fine wine and hits of cocoa. A combination of Irish Creme and White Chocolate Truffles. Irish Creme made from superior Irish Whiskey, frothed cream and fresh coconut milk. White Chocolate Truffles subtly blend hazelnut paste, ground almonds, cocoa and vanilla extract. Every Helix Amaretto cigar is handmade with premium tobacco. The smoke is mild with a sweet, aromatic, but not overwhelming, amaretto flavor. Vanilla over Marcona Almonds, Cafe Arabica & Criollo Cocoa. You will want to sit back and do nothing but smile as you smoke this cigar. Its that good!